Washoe County gets the green light to test drones for emergencies. Reno, Nevada. May 29, 2015. The Washoe County Emergency Management and Homeland Security Program received a certificate allowing the program to use Drone America's DAx8 Unmanned Aircraft System to test how the new technology can assist in emergencies. The Federal Aviation Administration (FAA) Certificate of Authorization gives the County the go ahead to work with the region’s first responder agencies from Fire Services, Search and Rescue, and Damage Assessment Teams to conduct a proof of concept and explore how the new technology can save lives and protect property within Washoe County. “This is exciting news for Washoe County and a remarkable step for the region in the process of integrating drones with first responders,” said the Director of the Washoe County Emergency Management & Homeland Security Program, Aaron Kenneston. The DAx8 unmanned aircraft will be used in specific areas in Reno under 400 feet above ground level. “This work will lead us to further development and increased capabilities providing our Reno manufactured drones with innovative solutions that will inevitably help those in need or danger,” said Drone America’s President and CEO Mike Richards. 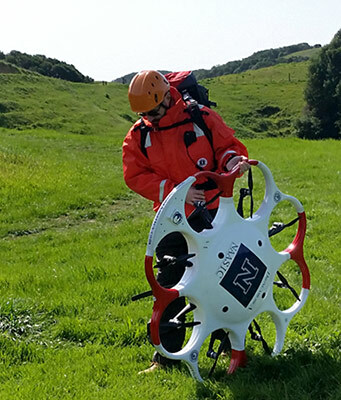 Drone America acknowledges the National Science Foundation (NSF), Partnership for Innovation Program, for their support of the efforts to develop UAS for first response. The NSF project is led by Principal Investigator Dr. Kam K. Leang, Associate Professor of Mechanical Engineering at the University of Utah. Dr. Leang is also working with colleagues at the University of Nevada, Reno and University of Nevada, Las Vegas, to help Drone America with the UAS first response efforts.